Promotional Materials - leaflets, Brochures etc. Euronics International Ltd. is an international association of over 11,000 independent electrical retailers in 30 countries. It functions as Europe’s largest electrical buying group on behalf of its members, who in Northern Ireland are some of the Provinces leading independant electrical retailers. 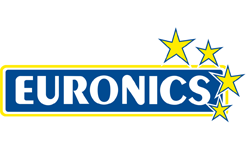 We worked with Euronics members in Northern Ireland to promote the Euronics Brand along with their own unique identities. We creaded television, radio , press and magazine advertisements, produced promotional literature – leaflests and brochures, undertook outdoor advertising and direct mail campaigns. Fulton Advertising and Marketing have worked with us for several years and have been influential in building the Euronics brand locally in Northern Ireland. Using Television, Radio, Press and Outdoor, their media knowledge and buying expertise have brought us significant benefits.